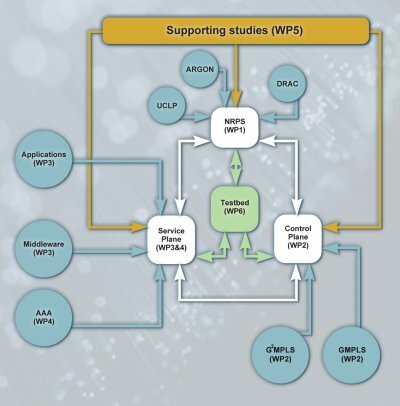 The Phosphorus project focuses on delivering advanced network services to Grid users and applications interconnected by heterogenous infrastructures. The project is addressing some of the key technical challenges to enable on-demand end-to-end services across multiple domains. The Phosphorus network concept and test-bed make applications aware of their complete Grid resources environment (computational and networking) and its capabilities. Phosphorus enables and tests dynamic, adaptive and optimised use of heterogenous network infrastructures interconnecting various high-end resources. 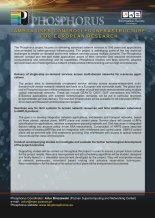 The project aims to demonstrate on-demand service delivery across access-independent multi-domain/multi-vendor research network test-beds on a European and worldwide scale. 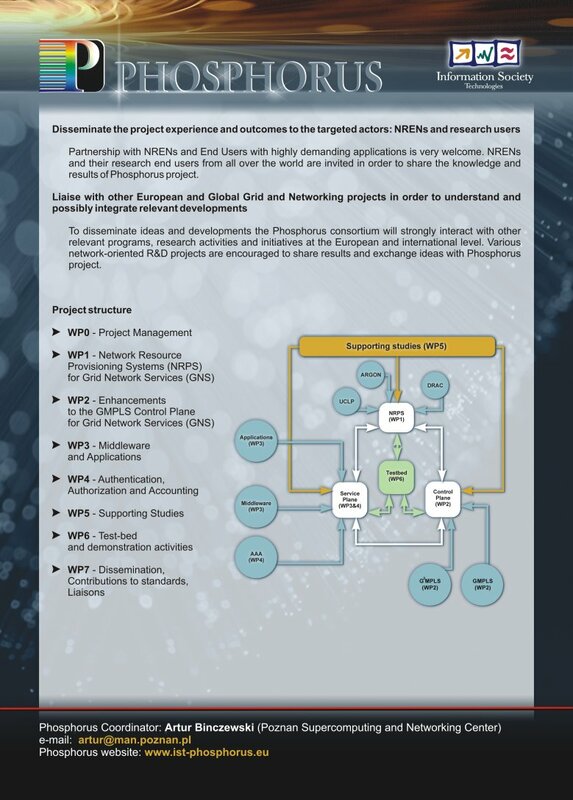 The global test-bed in Phosphorus project will be composed of a number of local test-beds interconnected using multiple optical international networks. These will include GÉANT2, CBDF, GLIF connections and NRENs. E-Science applications with extreme communication demands will be put in particular test-beds to demonstrate services delivery. The test-bed infrastructure will be available for all interested NRENs, End-Users and Research and Development projects. The goal is to develop integration between applications, middleware and transport networks, based on three planes: service plane, NRPS plane and control plane. Service plane will consist of APIs specification for applications, services components exposing network and Grid resources in integrated fashion taking into account policy driven AAA mechanisms. Construction of NRPS plane assumes adaptation of existing NRPSes and full integration with middleware and control plane. GMPLS control plane will be enriched with Grid extensions providing Grid middleware with access to optical network resources as first-class Grid resources. Supporting studies will be carried out throughout the project in order to ensure a proper future outlook for the project results. Resource management and job scheduling algorithms will be studied, designed and finally tested in a simulation environment developed by the project. 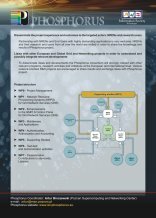 They will incorporate issues of network awareness, constraint based routing and advance reservation techniques. Recommendations for the design of an optical control plane will be analyzed and documented. Partnership with NRENs and End Users with highly demanding applications is very welcome. NRENs and their research end users from all over the world are invited in order to share the knowledge and results of Phosphorus project. To disseminate ideas and developments the Phosphorus consortium will strongly interact with other relevant programs, research activities and initiatives at the European and international level. Various network-oriented R&D projects are encouraged to share results and exchange ideas with Phosphorus project.